There’s something bonkers magical about breakfast options. It’s kind of like being a five-year-old kid in a candy shop. Only better. Because bacon, brown sugar, and butter are all invited to the same party. PARTY?! Yes, you know the little get together in your mouth? That one. Address: 5263 YUM St. City, zip code, and state—irrelevant. Speaking of directions, we’re going on a road trip. And you get to pick the destination. Maybe you want a bowl ‘o cereal with the “taste you can see” or some hippie, crunchy-granola noms. Or maybe, you’ve totally had a (cereal)ity check and just aren’t feeling pourable breakfasts these days. You’ve got some serious fancy pants on and are channeling a five-star resort ‘tude. The white, linen table cloth, tea scones & clotted cream, pleases-‘n-thank-yous sorta mood. I can totes roll with that. But let’s say for a moment that you want de-licious and de-luxe without the mini wheats or maitre d’s. I can dig that too. In that case, let me introduce you to the world’s most amazing breakfast sandwich. Pick a bagel like you a pick a car—with a scrupulous attention to deal. Then, round up the other troops. One sassy egg, a little blanket of cheese, some elegant arugula, a hug of honey. Where does one find a sassy egg? Ponder that. You know the drill from here. Classiness in front, comfort in back. Correct me if I’m wrong, but I think Hannah Montana would call that the best of both worlds. Lexi Cotcamp is a soon-to-be sophomore studying business at Georgetown University in Washington D.C. With a penchant for ballads and barefoot treks, she’s spending summer 2012 purposefully getting lost in the urban heart of the nation. Cut bagel in half lengthwise down the middle to create two circular halves. 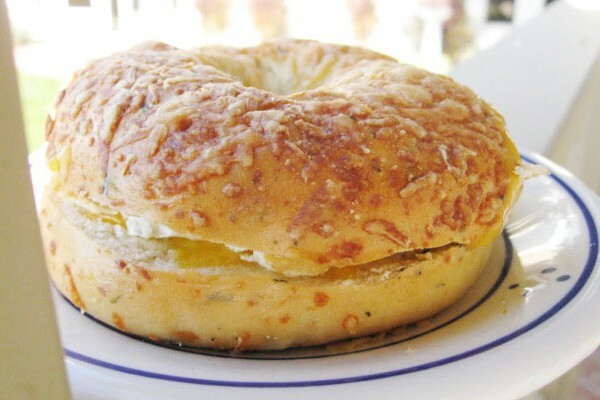 Sprinkle cheese on both halves of the bagel, spreading evenly on both sides. Place bagel halves in a toaster oven for about 2 minutes, or until cheese is warm and melty. Meanwhile, heat a small frying pan, and cook the egg to your liking (scrambled, over-easy, over hard, etc.). Remove bagel from oven and egg from pan. 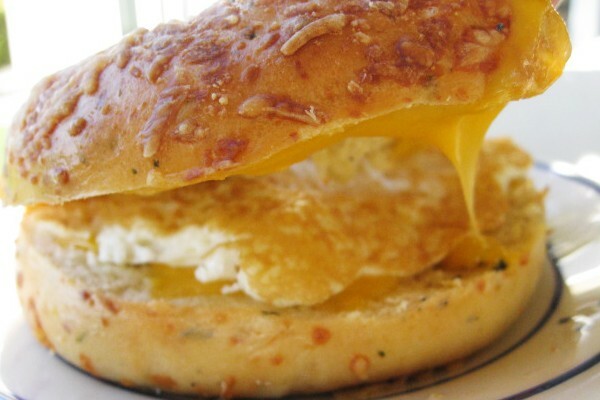 Place egg on top of bagel + melted cheese, and then add the arugula on top. Drizzle with honey, and then season with salt and pepper. Enjoy!